BOAT OWNER'S NOTES for a 2000 Sea Ray Bow Rider Signature Series in EXCELLENT condition, call the boat owner @ 619-328-2488. OVERVIEW: The Sea Ray 21’ bow rider is one of the best all round speed boats for family fun, It is rated for up to 10 people with room for gear as well,The Sea Ray quality is evident throughout The deep V hull allows for a stable ride and great handling and it was designed to be quick from a dead stop,It comes with the largest engine available for this model and has a tuned Vengeance stainless steel prop which can get a skier up in about 3.7 seconds,This is a very quick and fast boat up to 58 MPH. FEATURES: The seating is very cushy and comfortable with a large aft bench seat, two swivel sliding upgraded captains seats and bow seating,The aft seat can be raised to create a huge sun deck The marine grade vinyl feels and looks like leather, On both sides of the rear engine compartment there are large storage areas There is storage under the aft seats, the bow seats and all side panels, There is closed storage under the helm with trash bin, There is a lockable glove box with also features the Clarion stereo and optional 6 changer CD system, There is a built in insulated ice chest under the glove box, There are integrated arm rests with beverage holders, There is deck storage for skis & wake boards or fishing gear, There is an anchor storage compartment in the bow, The windshield is beautifully curved tempered and tinted. ENGINE INFORMATION: 5.7 Liter EFI 260 HP Mercruiser engine with Vengeance stainless steel prop, bilge pump, blower, easy access oil fillers and filters, battery shut off switch (with this switch my battery is lasting 8 years). INSTRUMENTATION and SAFETY: Engine oil, gear lube, & water audible alarm, depth finder ,horn, fuel, oil pressure, speedometer, tachometer, trim, voltmeter, water temperature, engine hours, running lights, Tilt steering wheel, Coast guard required package is on board and the boat has been inspected and passed by the coast guard the report is on board. FINAL NOTES: The boat is in excellent shape and has been professionally maintained, I am the original owner and I bought the boat new, The engine only has 253 hours on it and has lots of fun left, The only reason I am selling is that my kids have grown up & out and we don’t use the boat much anymore, It needs a good family to go home to, This Sea Ray comes with a galvanized two axle trailer with stainless steel brakes, the tires are almost new and have covers, There is a spare tire on the frame, The coupler was replaced about 6 months ago, For the right situation there could be skis, wake board, two tubes, professional tow ropes, ski vests of all sizes, and other misc equipment available. 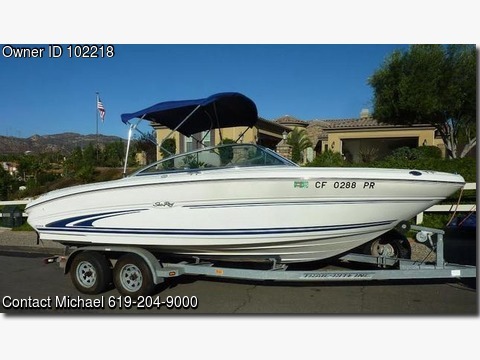 If you have any questions about the boat or want to arrange an appointment to see it call me (Mike) at 619-328-2488 or 619-204-9000.